Together with Siert Wijnia from FabLab Protospace I gave a workshop and presentation at SHiFT 2010 in Lisbon, Portugal. 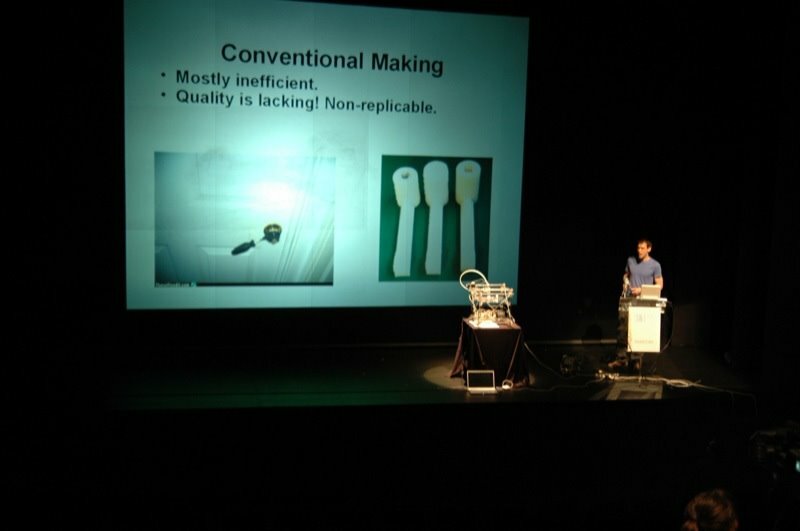 The topic was Personal Fabrication while highlighting the roles of FabLabs and the RepRap project in making fabrication technology available to the (creative) masses! Before going to Lisbon I shipped a batch of parts. A second Mini-Mendel machine was (partially) assembled during the conference. I will blog about this later! Slides: PDF (web), PDF (print), PPT (OpenOffice, source). Now, since the Icelandic Vulcano erupted I’m forced to spend my time on the Portugese beaches until my rescheduled flight departs on Thursday (hopefully). Next story Meta-innovation: Surprise boxes! Wow, looks nice! Is there a video of the presentation you gave? There will be, at least it was recorded and the conference organizers really want to share the great stuff from SHiFT 2010! When I have it I will upload it or link to it for sure! Slide 45 has a great image of a future z-corp 3D printer! 🙂 Where is that from? Yeah, I like it too. It’s nice for discussions on whether there will be an appstore with paid content next to free content or whether it will be fully open like Thingiverse currently. I’m afraid I’ve lost the reference of where it comes from. I like it too and would’ve wanted to give correct attribution.